All photos by Ian Mackenzie. Don’t forget these items and follow these rules and you will have a blast at Burning Man this year! 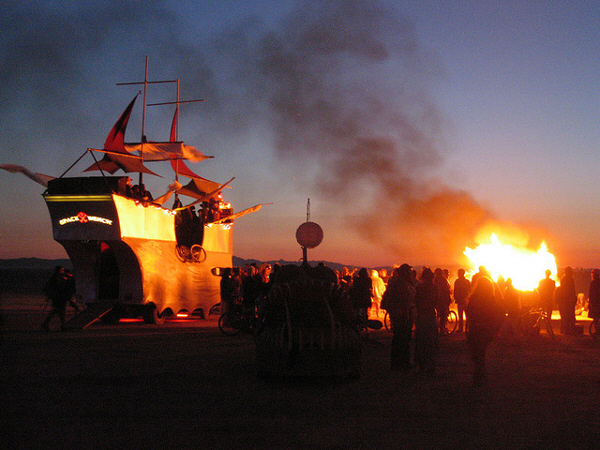 The first step to a successful trip to Burning Man is the trip itself. 1. Don’t make the trip twice – make sure you have your tickets! 2. Printed out google directions to Black Rock City (BRC) — there will be long stretches where you are out of cell service area, so don’t rely on directions from your phone. Directions from SF are here. 3. A spare car key – in case one of them is lost in the Playa. 4. A hide-a-key – so that you can leave the spare and people from your group can get into the car if need be, while everyone is out running around. 7. Make sure your tires are in good shape and you have a spare. 8. Either bring a small gas can or be very sure to fill up often — Gas stations are very rare during the 90 mile stretch from Fernley to BRC). 9. 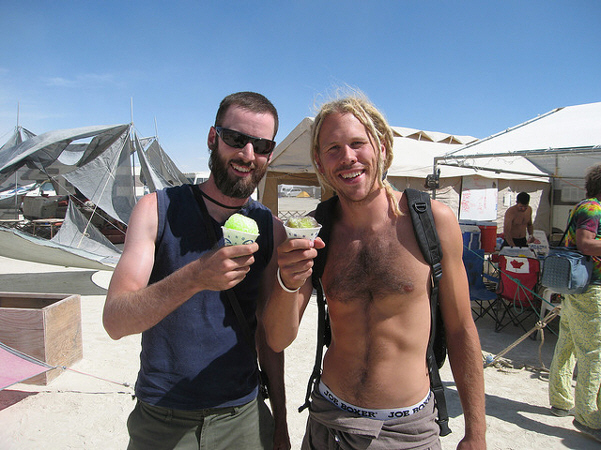 Some people choose to take illegal substances out to Black Rock City. Keep in mind that you will be driving through Nevada which has some of the toughest drug laws in the country. IF you are going to take illegal drugs to Burning Man, make sure you drive the speed limit and don’t give a cop any reason to pull you over. Having open containers in the car or allowing your passengers to smoke ganja is asking for trouble, as either one would warrant a full car/trunk search. The Black Rock Desert is not designed to sustain human life. It is hot, flat, windy, dusty, devoid of vegetation and water and very inhospitable. The more of the following things you can bring out, the more comfortable you and your group are going to be. 1. Shade structure! Get creative…it is essential to have some escape from the sun – and something that can sustain high winds. If you don’t know where to start, get some ideas here. 2. An RV — this is a big one. I take an RV out with my group each year because during the day it’s (way) too hot to sleep in tents and provided your RV has a generator, the air-con will save your life and make you lots of friends. And it can mean the difference between getting sand-blasted in a Black Rock wind storm to being inside, rolling doobies and cooking quesadillas. Unfortunately, RVs are crazy expensive for this week because it’s Labor Day and every rental place knows about Burning Man. If you can’t afford to rent an RV the traditional way, I have had luck the past two years scanning Craigslist for RVs that are listed “for sale”, and cold calling each owner to see if he would be interested in making a quick $1200 for a one week rental before putting it right back on the market. If you can pull this off and split the cost between friends it’s well worth it. 3. Tent(s) – If you have more than one tent, I would suggest bringing two. Anything left “out in the elements” will be covered in dust within 20 minutes of arriving on the playa. It’s nice to have one tent to sleep in and one to store all your stuff in. 4. Extra-long tent stakes – As I said above, the wind is no joke in the Black Rock Desert. 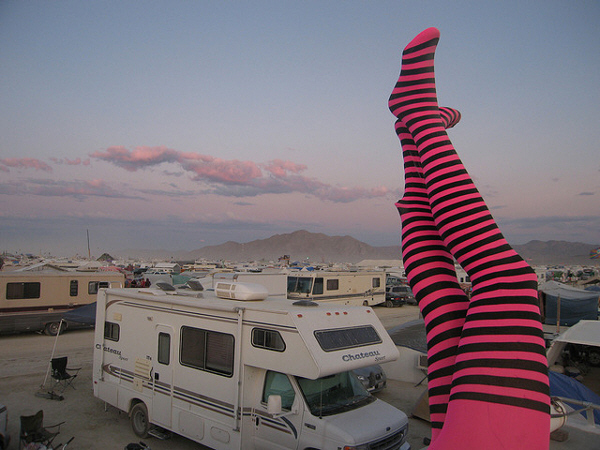 I have seen 60 mph gusts at Burning Man and I’ve also seen tents cartwheeling down the playa like tumble weeds. No fun…so when setting up your tent you need to batten down the hatches and expect the worst. Sometimes for larger tents it’s a good idea to bring super skinny rebar, which can be bent and driven down deep into the playa to hold your tent in place. 5. Warm sleeping bag – yes, it is hot most of the time, but around 3am, temps plummet and it can get very cold. 6. Sleeping pad – the more the better. 9. A large piece of carpet that you are willing to sacrifice — this is a really nice element to have in your camp. It will allow you to take off your shoes and and chill, and will also cut down on the overall dust-swirls where you’ll be cooking and eating. That green AstroTurf they sell at Home Depot works great if you don’t have an old carpet. 10. Folding card table(s) – if you have more than one, bring them all. It’s really nice to have a table to eat/cook on and just sit at when drinking/playing cards. 12. Lanters, tiki torches or other sources of ‘space light’. 13. Camping stove and extra gas – the bigger the better, so if you have a Coleman that you use for car camping, better take that over a an MSR backpacking stove. 14. Christmas lights or strands of LED lights to give your camp a nice glow. 15. A large tub for cleaning feet – after running around in sandals all day it’s SO nice to clean your feet off and put some clean socks on before going out at night. Being a ninja about planning your food/booze and kitchen is well worth the effort. 1. A huge cooler. I bring all the coolers I own and one of them could fit a body in it. I store food (after the Costco mission) in a few of the smaller ones and pack the big one with ice. (You will be able to buy ice in BRC but it’s expensive and a pain to carry back to your camp from Center Camp. Bring as much ice as possible. Dry Ice is even better. 2. Pots, pans, cooking spoons, strainer, cutting board. 3. A couple sharp kitchen knives. 4. Cleaning supplies for dishes, sponges, paper towels. 5. A pack of large ziplock bags. 6. A wash tub for doing dishes. 7. Bowls, plates, forks and knives – I would recommend either hard plastic stuff that can be washed or paper stuff that can be burned. 8. A large pack of the heftiest garbage bags you can find.